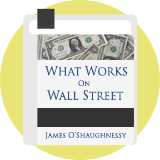 James O'Shaughnessy Cornerstone Value is a value investing strategy presented by US fund manager James O'Shaughnessy in his 1996 book, What Works on Wall Street. His extensive backtesting found that value investing works particularly well with large capitalisation stocks with above average sales and cashflow, high levels of share liquidity, which were then sorted for the highest dividend yield. O'Shaughnessy said: "Generally speaking, when things are going against you, as they inevitably will, you have to stick to the underlying strategy? Only by doing so will you be around for when it comes rebounding back." He found that this value strategy produced an annual compound return of 15% between 1954 and 1996, compared to 8.3% for the S&P 500 index. O'Shaughnessy has continued to conduct detailed analysis of Standard & Poor's Compustat database to identify the most effective investing strategies. Founder and CEO of O'Shaughnessy Asset Management (OSAM). Wrote the seminal 1996 book "What Works on Wall Street”. From 1951 through 2004, the strategy had a real average annual return of almost 19%. However, the downside to that kind of performance was the volatility. The standard deviation from the average return (24.6% when not adjusted for inflation) was about 39%.